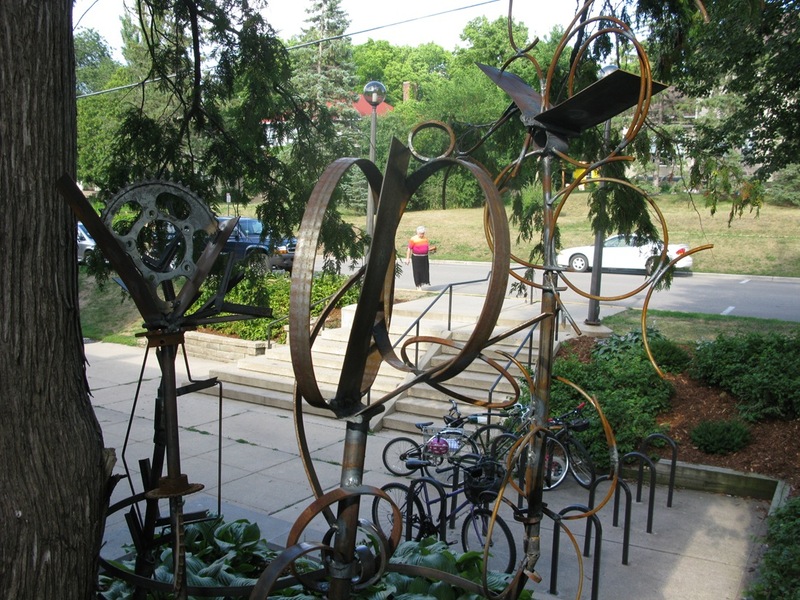 Artist Jennifer Wolcott has installed a sculpture at the entrance to the Northfield Public Library, a set of seven “bookhead dancers“. 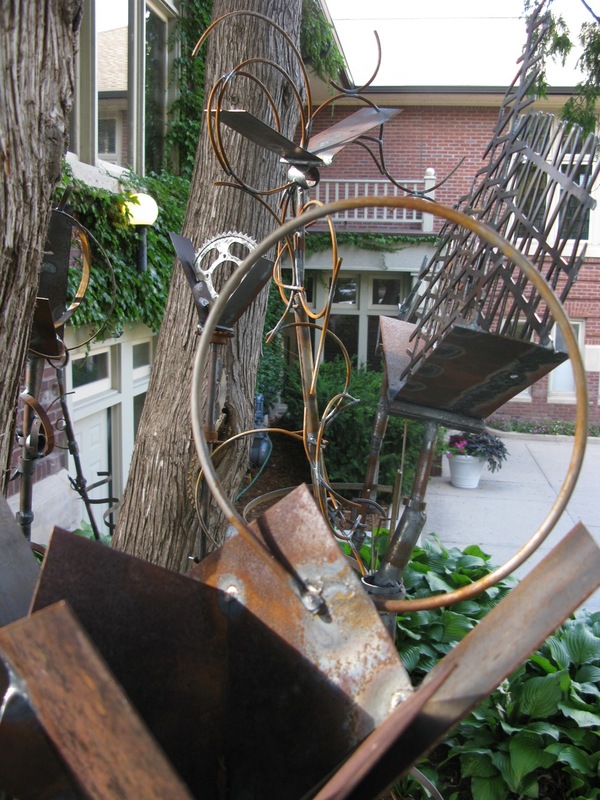 There will soon be a contest for kids to name the sculpture, but a patron is needed. 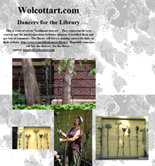 See the web page on the sculpture for more. This is the story of the dancers at the library. During the Northfield Garden Club plant sale iast spring, I had a conversation with judy Code a bout my loaning a piece of garden sculpture, such as an obelisk, to dress up a bed during the America in Bloom competition. A few weeks later I was walking down the sidewalk and Judy came by in pickup truck and yelled out the window that the library was the location for the loaner piece. A couple days later I walked around the library taking pictures of possible locations. When I came to the raised bed on the southeast corner with the tree trunks I could see a crew of dancers something like literate dryads. The dancer form; a knobby stem with some kind of topping or head, is a recent discovery for me. It pleases me with its mutability. It has aspects of plant forms, human forms and manmade structures like a staff of office or a street lamp. In repetition, it can build rhythym and movement. The form allows me to play with visual vocabularies. In the case of the bookheads they are individual to evoke a range of subject matter, where another situation might call for a more closely related grouping. I do hope the kids get to name them and of course I would be pleased to have them stay with the library. That brings up the darn business part of the deal. We need to find a sponsor, or seven sponsors to purchase them. Any one interested? Considering the changes that are coming at the library it is worth noting that the dancers can be moved and reconfigured to suit a different location with out a major fuss. Many thanks to Griff for setting up this Blog. 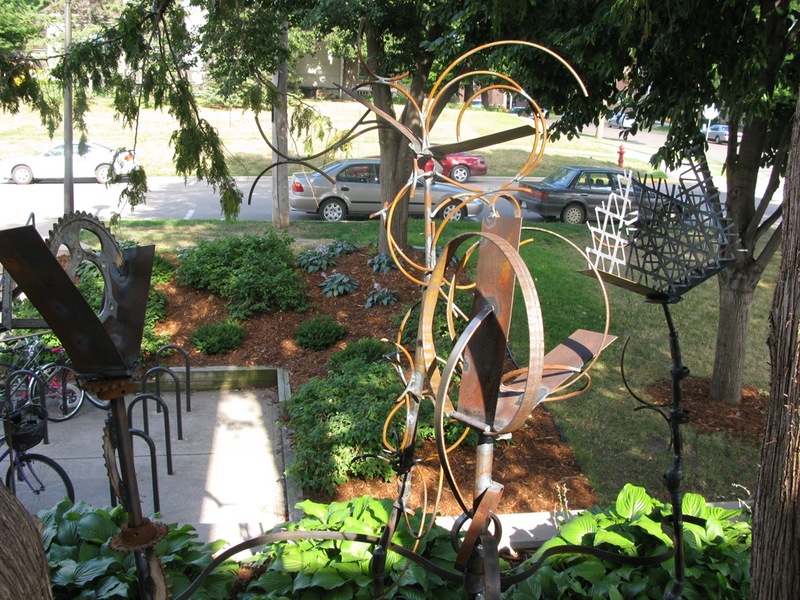 The Friends of the Library have stepped up with a contribution toward the purchase of the Wolcott sculpture. Last week, the Friends board, of which I’m a member, voted to contribute roughly the cost of one of the seven figures. 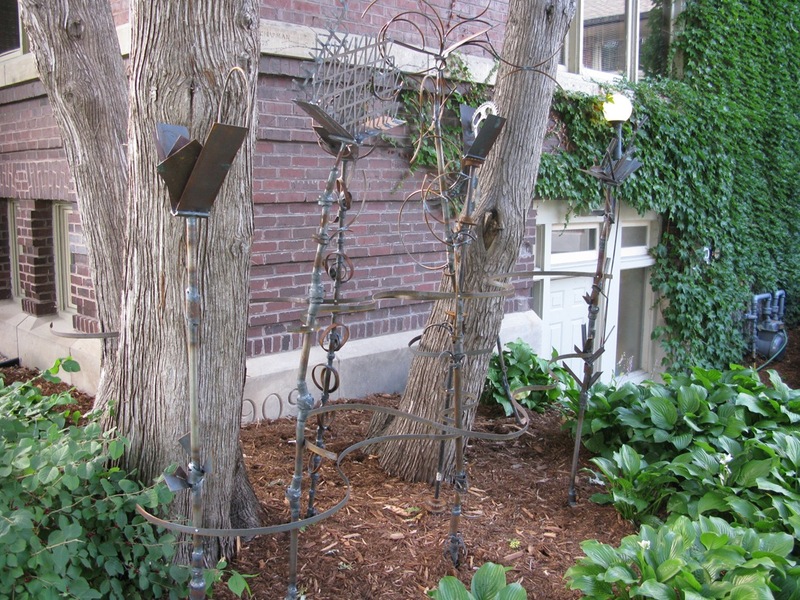 I blogged about it Friday at my garden blog because this is a great example of blending plants and sculpture in a public place, and the post includes some close-up shots of the bookheads. If individuals or groups would like to make a contribution, they should contact Lynne Young at the library. Mary, I edited your comment to include a link to your blog entry. Jennifer – Thank you for writing!